Everyone dreams of owning their own perfect paradisiacal island out in the Caribbean Sea. The idea of being able to kick back and relax among soft sands, palm trees, and gentle warm waters sounds like a dream come true. Well, we can't give you a private island, but we can offer the next best thing. Cozumel, a beautiful island just off the coast of Mexico, is a simply astonishing place to visit. Covered with mangrove forests and lined with picture perfect beaches all around, it's a prime example of the beauty of the Caribbean. Around 2 million people head out to Cozumel each and every year to appreciate the island's unique beauty and charming beaches. What was once a sleepy little island has now become an elite tourist destination, but the island is large enough to cope with all these new visitors and has more than enough stunning shoreline to ensure it never feels crowded or busy. You can visit Cozumel and find a private spot in the sun to feel like you're the only one there, with the island boasting a long list of world class beaches. Cozumel is a haven for beach-lovers. Both the east and west sides of the island are lined with silky sands and postcard palm trees. The waters are crystal clear and the waves are often very gentle, offering just the right conditions for swimming, paddling, snorkeling, and more. 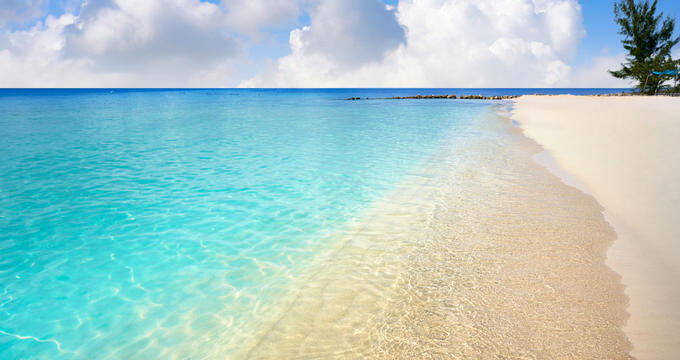 If you’re planning a trip to Cozumel and can’t decide which beach to visit first, read on for some overviews and key details on the island’s best beaches. Out on the western side of the island, where beaches tend to be more tourist-friendly and easier to access, Playa Palancar runs for over 3,000 feet in length and is one of the best beaches to visit on Cozumel. Why? Well, not only is it beautiful, warm, and welcoming, it's also equipped with a lot of useful amenities and features. Beach equipment like umbrellas can be rented at low rates at this Cozumel beach and there's also a huge food court area serving tasty tacos and refreshing beverages. You can even get massages on this beach, and there are plenty of hammocks set-up among the nearby palm trees for anyone who wants to lie back with a good book or take a nap in the sunshine. One of the most touristic beaches on Cozumel, Paradise Beach is also one of the best. As the name suggests, it really does look like a little slice of paradise, complete with stunning views in every direction and a seemingly endless stretch of soft, white sand. This beach has been fitted out to be extra friendly for families too, with a full water park featuring all kinds of activities and attractions like walls to climb and trampolines to bounce on. The kids will love it and the grown-ups can have fun too swimming around in the heated pool or relaxing with a massage or cocktail on a comfortable sun lounger. Lots of fun water-based activities can be enjoyed here as well like kayaking and snorkeling. Filled with palm trees to provide little spots of shade all along its soft, silky stretch of sand, Passion Beach is actually a private Cozumel beach, only accessed by private trips and tour operators. If you can get access to this beach, it's definitely worth the trip. It has some of the smoothest sands and clearest waters in all of Cozumel, and there's an on-site bar serving up all kinds of exotic cocktails and fruity creations. Passion Beach is actually a hugely popular spot for weddings on Cozumel due to its extra special beauty, so if you want to see one of the prettiest spots in all of the Caribbean, this is a must-visit beach. If you want to do some snorkeling and see some exciting marine life up close and personal, Playa Corona is one of the very best spots in all of Cozumel. There's a coral reef barely a hundred yards away from the shoreline, so it's a great spot for even inexperienced divers to do some snorkeling. You can see all kinds of fish here, and there's a local rental shop providing snorkeling gear and even guided snorkeling tours. When you're done, you can kick back at the local restaurant with some fish tacos and other tasty island treats. Do note, however, that this Cozumel beach has an entrance fee of $5 per person. This is one of the eastern beaches, which tend to be way less crowded than those on the western shore. If you're interested in privacy and exploration, checking out Cozumel's eastern beaches is a great idea, and Playa Del San Martin is the best way to start. However, it's important to note that the beaches on the east shore are less developed, without the same amenities and attractions as those on the other side. Visitors to Playa Del San Martin will need to bring their own equipment and snacks, but there are lifeguards on duty to keep everyone safe. Swimming can be enjoyable at this beach when the green flags are out, and the beach is beautiful to just walk along and admire.